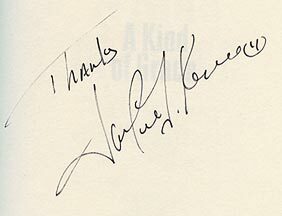 The 3 time Olympic Gold Medalist has autographed this mint condition hardcover book. 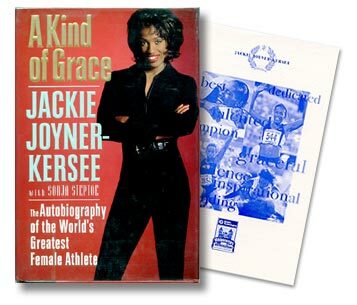 Included is an invitation to the 2003 special event where Jackie signed this book. good shape with dust jacket. The original owner has put a newspaper clipping, a 1987 review of this book from the Boston Globe, in the front of this book and it has discolored the end paper the same shape as the clipping. 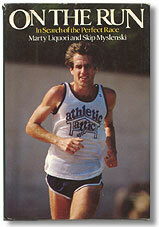 US Olympian and top miler Marty Liquori's biography that traces his great career, from breaking the four minute mile in high school to his legendary duels wih Jim Ryun. This hard-to-find book is in good condition with some minor tears on the top edge of the book jacket. 3 time Boston Marathon champion Cosmas Ndeti has autographed the cover of this issue featuring his photo. He added "Jesus is doing it again." How to order this magazine. Hardcover with a dust jacket, 163 pages. 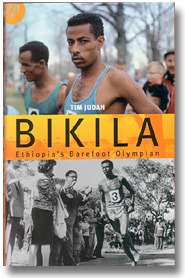 A biography of the great Abebe Bikila, two time Olympic Marathon Gold Medalist. This is a special purchase by Running Past from our friends at Reportage Press in London, England. Each copy has been signed by author and renowned journalist Tim Judah. Roberta "Bobbi" Gibb tells her unique story of being the first woman to run Boston, how it happened, and why she runs. This is a 28 page softcover booklet signed on the first page by Bobbi. Printed in 2001. 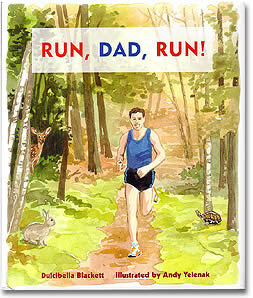 A charming childrens book about two kids and their running dad, and the day he ran to the rescue! This book is available autographed by the illustrator, Andy Yelenak, and can be personalized upon request. Andy discusses his work on the book here. A hardcover book with a dust jacket.